with special offer code GLOW2015. I unreservedly join the chorus of praise for noted surgeon's Dr. Atul Gawande's call for flexible, de-institutionalized, and more compassionate late-life care, from the time when a person needs help with the everyday tasks of living through to the days. Though concerned with the US medical system, it's relevant to anyone who wishes to address that period with compassion and competence. This is a subject we can uneasily avoid, and in fact I had it on my Kindle for months before I waded in—but I'm glad I did. Dr. Gawande doesn't sugar coat his pill, but neither he does default to the vague "something must be done" approach. He gives readers some tough love, tracing the lives of family members and patients who endured displacement, pointless and invasive procedures, and (worst of all to me) a disgraceful dearth of straight talk from the medical community. Gawande contrasts these incidents with inspiring stories of unusual and innovative resources, from assisted living facilities alight with birds, dogs and visiting schoolchildren, to hospices where both physical and emotional comfort are freely supplied to give each patient "her best day possible, now." Each of us can influence health policies and practices, through how we vote, the requests we make of health care professionals, and how we approach family decisions. But in order to raise our voice, lend a hand, or even hold a hand, we need to know what counts, as the bottom of life's hourglass fills. "Being Mortal" will be a book to which I return, and will inform many conversations. Concurrently, I watched Dr. BJ Miller's TED talk (19 minutes), "What Really Happens at the End of Life", about how he and the staff of the the Zen Hospice of San Francisco care for their residents. Normally I can waste time on a makeup video for some goop I don't even wear; this really did change my life, and will likely change my dying. Please watch, to experience a realistic sensitivity that is both rare, and deeply needed. Thanks to TED's generous policy, I am posting it here. I hope each of us, and our loved ones, can one day be helped by such lovingly radical caregivers. 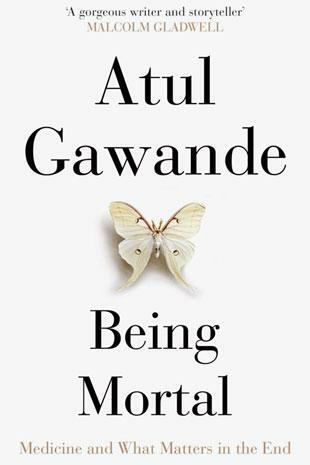 Gawande's book is the most important book I read this year, and I've recommended it often. I do wonder how many of those I recommended it to will pick it up and read it because, yes, it's a topic we like to avoid. I'd say we do so at our peril, though. We really need to start making these changes now! Dr. Gawande's book informs and confirms a lot of what I've experienced and thought about over a number of years. I posted it on my Facebook page in hopes that others might read it as well. Not sure where leadership will come from on the changes that need to be made, right now it looks like we are each on our own, putting together our individual solutions, most of which will require a fair amount of money. I've seen the TED talk and have read the book. Currently applying this to end of life care for my mother, who I have taken into my home since my stepdad can no longer deal with her care. This weekend she was up at 1 am, crying with happiness...saying how loved and cared for she feels. She is ready to accept death anytime and also having each best day possible, now till the inevitable happens. She is happy and content to go at anytime. Can anyone ask for more than this, in a terminal situation? I am learning so much about dying a good death. So thankful for these people and conversations! I really appreciate this information. My father has been struggling for awhile now, and I have felt frustrated by my lack of information about what might be a kinder death than others -- IOW, what we might choose not to treat, in order to avoid an endless decline. It seems an almost unspeakable topic, even with people who have lost parents. I heard him.speak on NPR when this book was released. He was so on point and I wish more people understood the whole "death panel" talk in the States was such hogwash. Hospice can 've a wonderful experience and more need to know about it. Some of the assisted living facilities he brought up sounded amazing. Wish they were the norm. materfamilias: I wonder, too. I hope every library has multiple copies. The legal changes for desired, voluntary end of life options in Québec are very welcome to me and I hope other provinces follow. Private home care is expensive. My mother did it and warned us she would spare no expense; it made her happy and comfortable. The Widow Badass: I only hope for that, and your mother sounds like a remarkable woman. bomm: And why, we wonder, is it unspeakable? As a geriatric psychiatrist friend said, "Nearly every one of us wishes a gentle, loving end for our parents." Miss FiFi: The death panel myth, an odious piece of misinformation, was concocted to fight universal health care, specifically, the extension of coverage to the uninsured. I thought I knew quite a bit about hospice care, but I learned much more from "Being Mortal". Thank you for suggesting this book Duchesse. I will be reading it. And yes, the whole death panel smokescreen was shameful, in my opinion. Thank you for suggesting this book. My sister also recommended it when we were together at Thanksgiving. I will read it too. Thanks for bringing the documentary to my attention. We used the hospice care at Toronto Grace several times while my husband was ill. Wonderful staff, the doctor actually made house calls!! His regular doctor refused to do so. You've got me thinking about the hospice care that developed for a much younger demographic: those hit by the AIDS crisis in the 1980s-90s. It hit many groups (and those in no specific at-risk group) but the people I knew who suffered and died from it were young-to-middle-age gay men, in my case friends working in the arts and academia. Quite a few of these patients were estranged from their families and sadly, their needs gave quite a boost to hospice palliative care. Today is World AIDS Day. I haven't seen the video yet - I've been quite busy today and am also a bit overloaded emotionally between Paris and the upcoming anniversary of the Polytechnique massacre (I was also writing a graduate history exam in a nearby building on campus there). Promise, I will. I feel very strongly about the right to die, and think we can build safeguards against risks of abuse. Thanks for the video and book recommendation. I'm a member of Compassion and Choices - https://www.compassionandchoices.org/ and I encourage anyone facing these issues to look them up, they provide a lot of services for individuals and families. Thank you for sharing this video. Very timely. But please know that not all who are dying are seeking a more graceful exit. My father was not interested in hospice and wanted every measure available until the end. Luckily the U.S. hasn't lurched far enough along the path to those decisions being made by others. Death panels may be a harsh way of looking at it, but if care isn't available to the dying, even extraordinary care, then the term is merited. The leukemia drug that kept him alive isn't covered under the NHS, as determined by the panel that makes those decisions. ErinMN: Gawande's book clearly states that the request for "every possible intervention" must remain available to those who wish that, and says that is the typical physician's approach based on years of training, including his own. A "graceful exit" is not a premature exit. Gawande explains how palliative treatment can, when desired, be offered •in concert• with active treatment like specialized drugs- a "have it both ways" strategy. I hope you will read the book. Because you use the term NHS, I assume you are in the UK, and I am in Canada; though we have universal health care systems, not all drugs or procedures are covered. In cases when a drug is not covered by the prescription formulary, or an experimental treatment, the cost can be staggering. In those cases, various things may happen: a philanthropic organization pays the bill, families pay privately, or raise funds. Health care policy-making entails the balance of standard of care with cost; those decisions are made by a consortium, board, court or ethics committee. Such groups are not, despite their requirement to make complex decisions, "death panels", even when the effect of some choices is to delimit what is covered for terminal cases. The term is inaccurate, because such groups are not mandated with deciding whether individuals are worthy of care, as Sarah Palin tried to lead American voters to believe. The book sits on my nightstand as we speak. The publisher emailed me about writing a post on the book's great success, so I wrote back, "Sure, but could I please have a copy for review?" They were very nice and sent me one. I find myself thinking more kindly of death now than I used to, and feeling more in my gut that it cannot be denied or avoided, that we might as well think about it and maybe there's something to be gained. LPC: The book is useful when considering our own preferences, and I wish I had had it when my parents were in their last years. 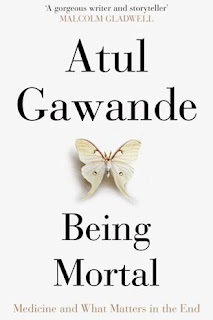 Had we had Gawande (and Miller's) guidance, our family would have handled matters both small and large, with more sensitivity and assurance. I haven't read the book yet, although it has been moved from one stack to another and back again. You remind me that it is high time.